The release of the Super Mini-Pla Thunder Gridman set is only a week again, but if that wasn’t enough to whet fans’ appetites Bandai have also updated their official candy toy blog with preview images of the accompanying Gridman Sigma and Dyna Dragon set! This extensive set of images gives us a better look at unpainted versions of both model kits, along with Dyna Dragon and its multiple components – the King Jet and Dragonic Cannon/Dyna Fighter! Also included is a preview of just how Dyna Dragon will combine with both the Gridman and Gridman Sigma figures to form King Gridman. 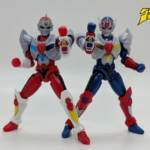 The Super Mini-Pla Gridman Sigma and Dyna Dragon set is a premium Bandai exclusive due for release in February 2019. It is available both as a two-pack for 6480 yen and the Dyna Dragon on its own for 4860 yen. Check out the full selection of images after the jump!